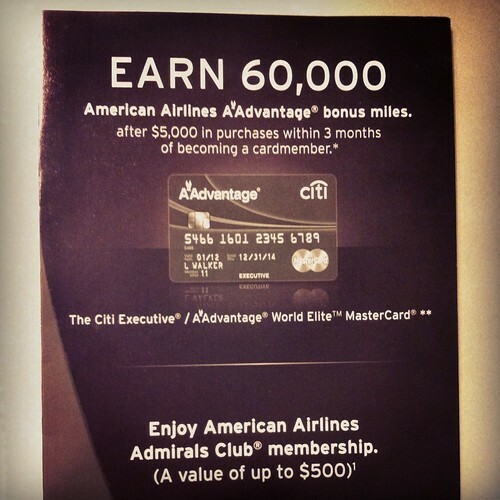 I was at the Atlanta Admirals club last week and noticed a brochure offering 60,000 AAdvantage Miles when you sign up for the Citi Executive AAdvantage World Elite Mastercard. This is much more generous than the 30,000 AAdvantage mile offer published at AA.com. Earn 60,000 American Airlines AAdvantage bonus miles after you make $5,000 in purchases within 3 months of becoming a cardmember. This is the up market, $450 annual fee, card that includes a membership in the Admirals Club. It also offers 10,000 Elite Qualifying Miles after $40,000 in “eligible purchases”, but unlike all of Citi’s other cards, there’s no 10 percent annual rebate on mileage redemptions (up to 10K miles per year). I read through the brochure and didn’t notice any expiration date with the offer. If you’re interested, you can find all the details here: aadvantage.miles.citicards.com. Looks great! Coke Zero on tap! Win a free Admirals Club Day Pass! Speaking of the Admirals Club, one of my favorite fellow AA geeks has teamed up with one of my favorite websites to offer an Admirals Club day pass giveaway! Mr. Perry Platypus and The Flight Deal are giving readers a chance to win one of two Admirals Club day passes. To enter, all you have to do is visit this page at The Flight Deal and post your favorite travel destination by November 14th, 2013 at 11:59PM Eastern. Two winners will be picked in a random drawing on November 15. Go here to enter. Good luck! I saw this pamphlet at the AC in ORD before Chicago seminars. Still debating if its worth it or not. I would go all in and try for the 10k EQM. Can I still apply for it and receive the bonus miles if I already have other citi AA cards? If travel a lot overseas, it definitely worhty the money, since City don’t charge foreign transaction fee in this particular credit card. We are going to BOS for Xmas and would love to visit the lounge.